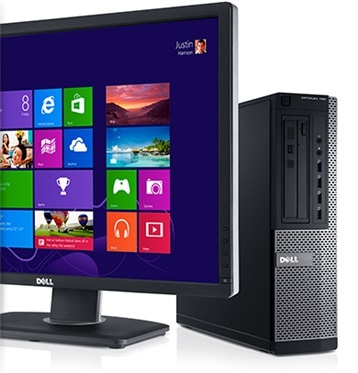 Dell Premier Graphics information is provided directly from Dell. See the Dell “Overview” tab for general information. Click on “Compare Side by Side” to see graphics choices. The line titled “Available on Optiplex” will show possible video port options. The Optiplex 7010, 9010 and 9020 have three integrated video ports on the motherboard. Two of these are DisplayPort, DP, and one is the video graphics array, VGA. You will need the DisplayPort, DP, to digital visual interface, DVI, (DP-to-DVI) adapter to connect to a DVI monitor. You will need two of these adapters, if you want to use dual DVI monitors simultaneously with integrated video. Adapters are not needed to use DisplayPort capable monitors with DisplayPort video cables. The older 59 pin Y adapter, DMS-59, is no longer necessary. P2214, P2414 have DisplayPort, DVI and VGA ports. Max resolution is 1920x1080. P2213 has DisplayPort, DVI and VGA ports. Max resolution is 1680x1050. P2212, P2412 have DVI and VGA ports (no DisplayPort). Max resolution is 1920x1080. P2211, P2411 have DVI and VGA ports (no DisplayPort). Max resolution is 1920x1080. From the Dell link above, see the “Monitor Setup” tab for monitor configuration details. The HD 7470, 7570, 8490, 8570 and R5 240 video cards each have 1 DP and 1 DVI. To run dual DVI, only one DP-to-DVI adapter is required.